I’ve been going nuts over a Midwest Living magazine this summer and you’ll see more recipes inspired from them in the coming days and weeks. This recipe, Orange Apricot Snack Cake, was inspired by their Vanilla Orange Snack Cake and is so much more than it sounds! 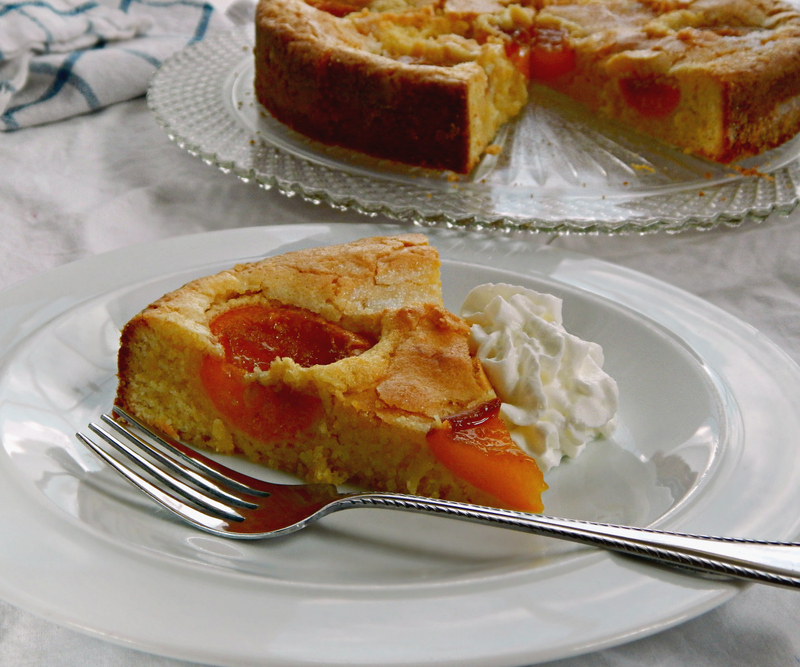 The Orange Apricot Snack Cake is gorgeous – just a bit of texture from the cornmeal and the top has a nice crispness from the sugar – and the apricots almost turn into a candy. Seriously, those apricots are just about jewel-like. I did do just a bit of adapting – they used vanilla sugar, which has to be made a week ahead, and I upped the citrus in this cake. Although Orange Apricot Snack Cake has a bit of sophistication, it also has a simplicity about it that smacks of down-home goodness. It’s something that your Grandma might make if she were from some far flung place and she’d serve it on glass plates over doilies. Midwest Living really nailed it with this recipe. Easy and quick, I’ll be making this, and perhaps variations of this, using different fruit, over and over again. Preheat oven to 350 degrees . Grease bottom of a 9×2-inch round cake pan or spring form pan. Line bottom of pan with waxed paper or parchment paper; grease and lightly flour pan; set aside. I recommend the spring form pan because the cake will not have to be inverted; the apricots may have juice pooled in them. In a small bowl, stir together flour, cornmeal, baking powder and salt. In a large bowl, beat butter and 1 cup sugar with an electric mixer on medium to high-speed until combined. Add egg yolks, buttermilk, zest and vanilla extract and mix until combined (it may appear slightly curdled). Add flour mixture, beating on low-speed until just combined. Spread batter evenly in prepared pan. Arrange apricot halves cut side up on batter (without pressing down). Sprinkle with two heaping tablespoons sugar. Bake for 40 to 50 minutes or until a toothpick inserted near center comes out clean. Cool in pan for 15 minutes. If using a cake pan, place a rack over pan and carefully turn cake out of pan. Invert onto a serving platter. If using a spring form, run a knife around the edge, release and let cool before removing the parchment and moving to serving platter. Dust with powdered sugar if desired. Serve warm or at room temperature. Click over to our latest Throwback Thursday post for links to their blogs and social media, rules and more info or, as always, to see all the links or add your own, click on the little blue frog, below. As always, to view the links (there’s a photo of each post) or to add your own, click on the little blue frog, below! And, as I do almost every Friday, I’ll be linking up to Angie’s Fiesta Friday – this is Number 133 and Saucy Saturdays! This entry was posted in Click here for Fabulous Food Posts and tagged apricot, Buttermilk, Cake, cornmeal, Desserts, Fruit Desserts, Midwest Living, Orange. Bookmark the permalink. I could imagine how good this cake is. Yum! My favorite kind of cake Mollie– simple and fresh fruity! We were just in Wisconsin visiting our daughter and I picked up a copy of Midwest Living Magazine– lots of good cooking ideas in there! Saving this recipe! thanks. I’ve gotten a few of my favorite recipes over the years from that magazine. I think I loved every thing in their section on stone-fruit!! Definitely my kind of cake for the summer! We have wonderful fruits, and my family looooooooooves fruit-cakes. Winnie, thanks so much!! I appreciate all the compliments! That looks delicious! I love the touch of cornmeal in there too. You have me on a cornmeal kick lately! It’s a bit funny but I haven’t used much cornmeal for ages and now I find myself using it a lot…the little bit of texture IS really good in there! Oh YUM! I made a peach upside down cake yesterday that was good, but this looks even better. Might have to give it a try. Oooh I love peaches! I don’t think I’ve made anything (at least on my blog) with peaches all summer! I do seem to be going on a frenzy this year from fruit to fruit – Well there’s time enough for chocolate in the fall!